Get out the pumpkins cause Halloween is right around the corner. Who says you can not enjoy Halloween while being pregnant. In fact, some of the most fun costumes are those that come from expectant mothers. As fall begins to roll around, and the costume shopping begins, make sure you have your costume ready to go. If you are still unsure about what costume you want to rock, the good news is, we have got some ideas for you. Here are some of the cutest pregnancy Halloween costumes for you to try out during your maternity. From wacky and wonky to cute and innocent, we have got it all! This next pregnancy Halloween costume is absolutely hilarious. 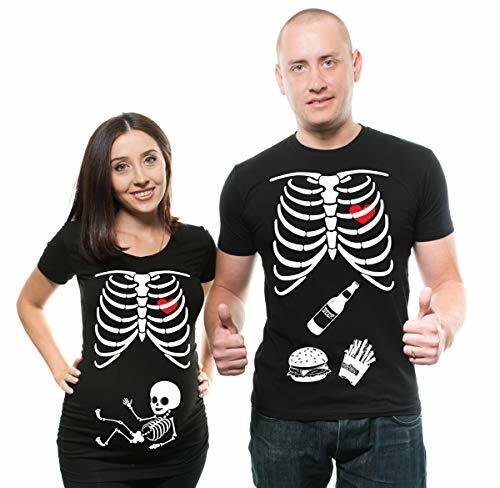 Show off what is really inside with this cute couples Halloween maternity outfit shirt. This an adorable outfit to wear with a couple, because the little kiddos you greet at the door will quickly get a visual understanding followed by a laugh. If you a teacher and are looking for a fun halloween themed outfit to wear to work, then look no further. Get your pair on Amazon today! This next costume is the classic spin on the traditional pun. While this costume may be a little bit difficult at home, you may fair better purchasing the set online. This bun in the oven costume not only is hilarious but it is excellent if you are looking for an obnoxious pregnancy Halloween costume to wear. The little kids may not quite get it but the adults will have a fun laugh about it. Finally, if you have not yet announced your pregnancy, this is one of the best ways to share the good news with your friends and family! This next pregnancy Halloween costume will fly over the heads of any children you encounter. However, this does not take away from the hilarity of the ensemble. The great thing is you probably have everything you need right in your own closet to pull off this funny pregnant Halloween costume. Dress up your man in a white shirt, black slacks, and black bowtie. When it comes to your outfit, find something classy and chic that is a classic look of the 50's. This easy couples' pregnancy costume is the perfect fit for any couple looking for a great costume to get a laugh or two. One of the cutest pregnancy costumes to rock if you are expecting twins is the “two peas in a pod pregnancy costume.” This pregnancy Halloween costume is so cute and effortless and easy to make. All you will need is a green shirt, some green felt, and two green balls. Simply decorate the balls so that they are sporting happy or silly faces. Wrap the balls in a long green felt, and then securely attached your makeshift peas in a pod onto your green shirt. This easy and effortless pregnancy Halloween costume is easy, effortless, and just so much fun! Pregnancy makes you tired to begin with. If you are looking for an easy to do pregnancy Halloween costume then this one's for you. This next pregnancy Halloween costume is great for any sports loving mama. What you will need is a small sized hula hoop, and some long white cord. You will also need a black shirt with an orange bottom half that you can draw a basketball design on. Or if you are feeling really creative, you can even cut out a basketball in half and secure one half onto your belly. Simply lace the string together so that it creates a basketball hoop lattice. Then, attach the string to your hula hoop and wiggle yourself into the hula loop. With a whole lot of string and a little bit of creativity, you have got yourself a slamdunk pregnant Halloween costume! Here is another easy and effortless pregnancy Halloween costume to rock this season. To rock this pregnancy Halloween costume, you will either need a white shirt to draw on or you can print out an easy button logo design big enough that you can tape down onto your shirt. If you are feeling really particular, you can even shop online to purchase this easy button pregnancy costume. However you decide to put this outfit together, one thing is for certain. It will remain funny for many seasons to come. This next corky pregnancy Halloween costume is perfect for showing off just how much your little one is worth it. Dress this up all by yourself or pair together with your partner or a younger sibling to rock this Halloween costume. If you do pair up with your partner for this pregnancy Halloween costume, then it is a must that your partner be a little leprechaun. Our opinion? It’s a thousand times cuter to have a little sibling be the leprechaun. Professionally printed super soft funny and awesome tees. Our lightweight fitted tees are made from ultra soft ringspun cotton to get that comfortable fit and feel. Once you put this shirt on, you won't want to take it off. Satisfaction guaranteed! This is a maternity shirt designed to fit expecting mothers. Sizes tend to run small, so order a larger shirt if you're between sizes. If you are unsatisfied with the fit, we will provide an immediate exchange. If you already have thing one and thing two already, then it’s a must that you dress up with an arrow pointing to your belly labeling things three is on the way. This cute Dr. Seuss pregnancy Halloween costume will be a fun treat for all the kids in your neighborhood. So be sure to have fun with this one! This next pregnancy Halloween outfit is perfect for any mom who just wants a simple and easy pregnancy outfit to throw. This cute shirt is not only super comfortable, but it is easily one of funniest tee shirts around to wear around Halloween. 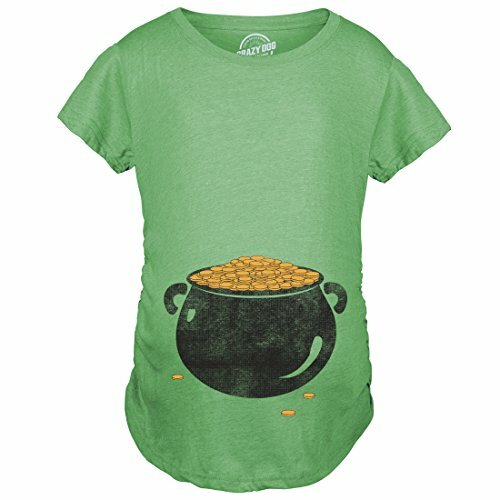 If you have little kids or will be around little kids, this is a great halloween maternity shirt that will have you giggling. Dress it up or dress it down, whatever you do have fun with it! Order yours now. Exclusive Crazy Dog T-shirt branded tee designed and printed in the USA. We use the highest grade plasticol ink and state of the art equipment to ensure vibrant colors and lasting durability. Our unbeatable tees are the perfect gift for any occasion and the prices can't be beat! Professionally printed super soft funny and awesome tees. Our vintage lightweight fitted tees are made from ultra soft ringspun cotton to get that comfortable fit and feel. Once you put this shirt on, you won't want to take it off. You are not going to have as much time to have fun in the first couple of weeks once your little one arrives. Get out all of the creativity and fun you have inside of you this Halloween season before that time comes. After all, finding the right pregnancy Halloween costume will be something that you and your budding family will cherish for the years to come. While you are dressing up, make sure to take lots of Halloween photos so that you can keep this memorable moment fresh in your minds for years to come!